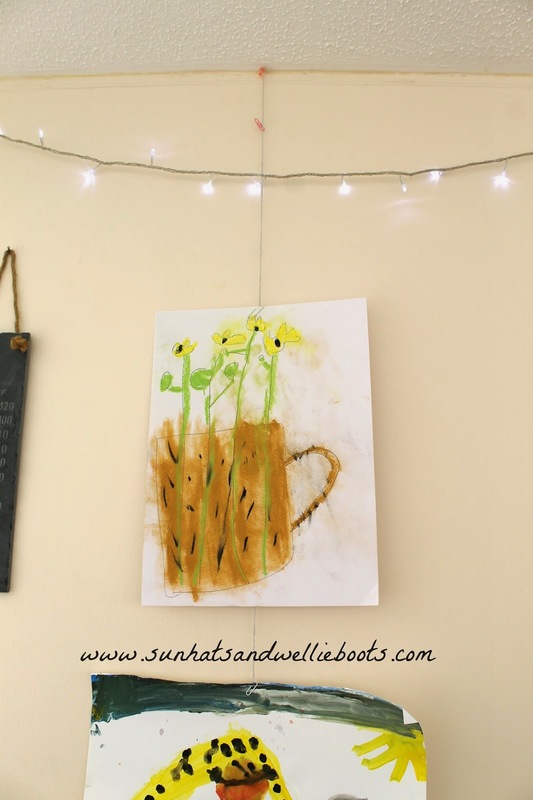 Do you have a creative kiddo who enjoys drawing & painting? We have a very eager artist who offers countless masterpieces every week. Our fridge was constantly covered in a vast array of artwork created both at home & school & I never seemed to have enough room to display all the important pieces of paper. I've framed some & have them hanging in various rooms, but the flow of paintings & sketches kept coming & they were just being pinned over the top of one another & soon became lost in a wodge of papers. I'm also reluctant to stick the pictures on the wall as the sticky tack always seems to leave a mark, so we came up with an alternative way to display those precious offerings. 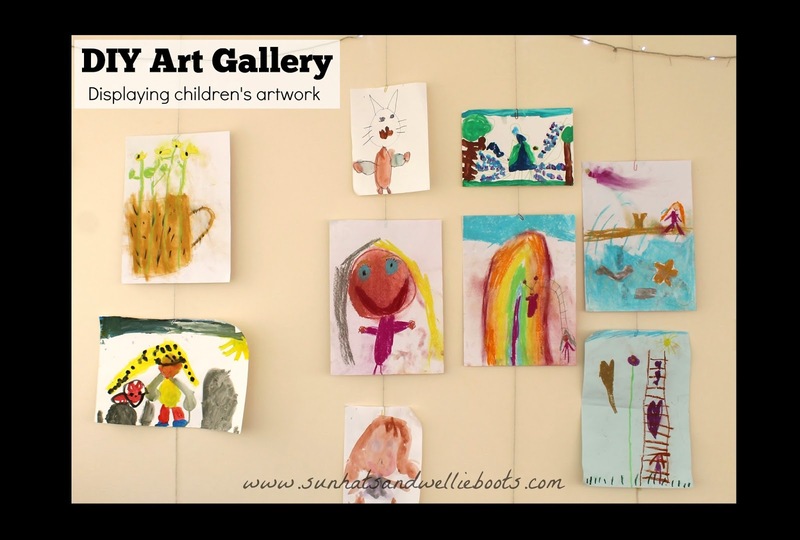 We created our own art gallery! This was so quick & simple to put together, & it allows numerous pictures to be hung at the same time. 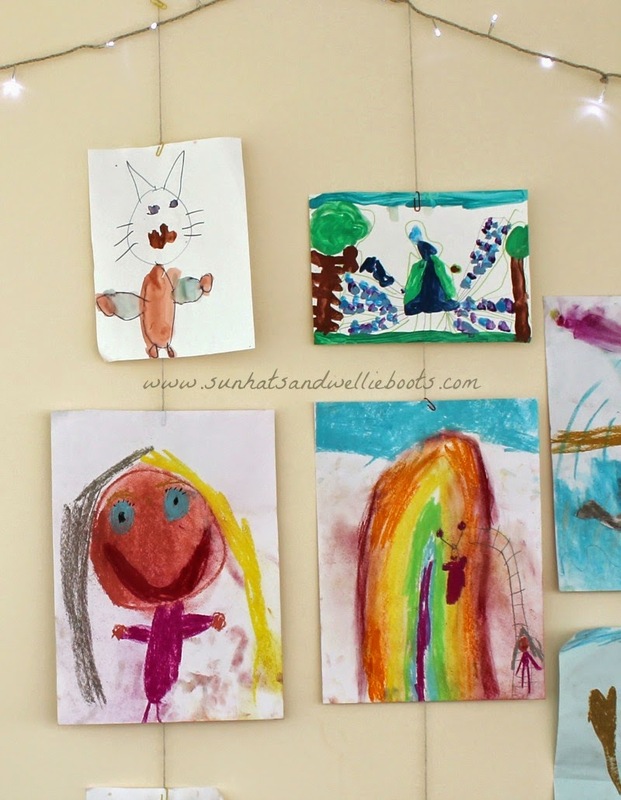 As the fixings holding each picture are easy to add/remove it means little hands can help put the artwork up too, & they can design the layout of their work. To make the basic backdrop for the gallery we hung lengths of string from the ceiling using pushpins. Obviously the length of string will depend on the ages of your children, but we hung ours so they were just above the top of the radiator. To hold each picture in place we simply used a paperclip which we first added to the string & then slipped onto the centre of each piece of paper. We've added several works of art to each string & they've held really well with no slipping or movement. The great thing about this gallery is that it doesn't remain the same for long, as soon as a new piece of art is created it replaces an older one, & the artwork that comes down either goes into an art folder or is sent to a relative to brighten their day! To add a little sparkle & light to the gallery we strung a set of fairy lights across the top so that even at night the masterpieces are illuminated. The pride on my girl's face when she sees her art hanging up is a picture, & when a visitor passes a comment on her work she beams from ear to ear! 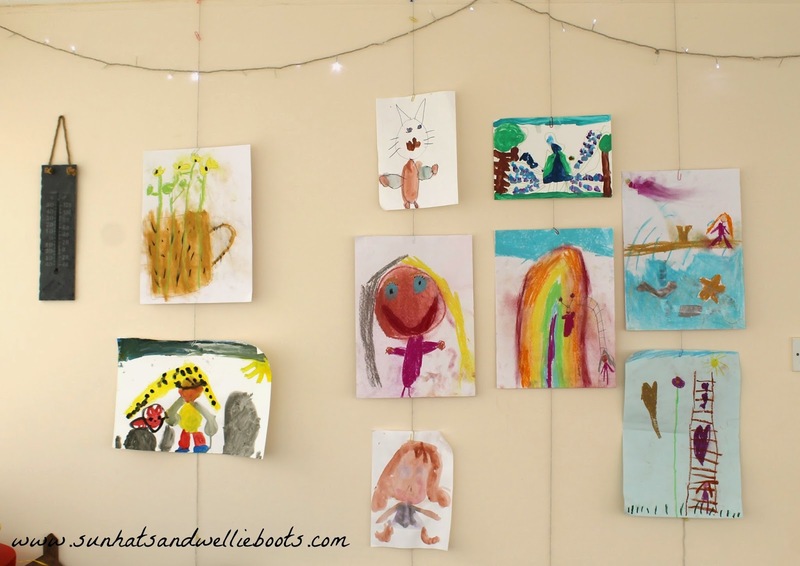 Such a simple but really effective way to display a number of pictures in one space & a wonderful way to boost a child's self-esteem & confidence. And no longer do you need to worry about a mountain of papers hanging from the fridge, or the sticky tack dot-to-dots on the walls, you now have a unique art gallery for all to admire.